The New Super Luigi U community has been a shitposting safe haven on the Miiverse since 2016. But soon, it, along with several other miiverse communities, will be no more. You can still save your shitposts, though. As you may know, the popular Miiverse platform will be shut down by Nintendo on November 7, 2017. Miiverse not only gave users the ability to connect with other players, but also the tools for making some pretty sweet drawings. Almost 95 Wii-U games and features, like the original Splatoon and Mario Kart 8, as well as 16 Nintendo 3DS games will be affected by this shutdown. On social media platforms like Twitter and Amino, Miiverse users have been memorializing the shutdown of their beloved network by sharing their old posts, or creating mournful art. User olivia shares her old Splatoon art on aminoapps.com. Others have been reaching out to members of the community to continue their friendships on different platforms, such as the Switch and Discord. But other people are just ready for the whole ordeal to be over. 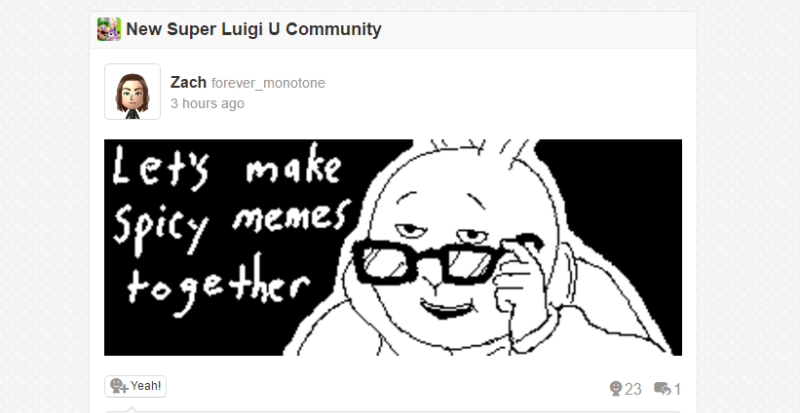 Posts such as drawings and memes have been some of the highlights of the Miiverse. If you’re concerned about losing your Miiverse posts forever, fear not! You can request your post history, including your drawings and screenshots, on the Miiverse site by clicking the “Request Post History” link. Your Nintendo account must be linked to the Nintendo Network ID you use to access Miiverse. Once the service ends, an email with be sent to your Nintendo Account, though the Nintendo support site points out it may take a few weeks. The email will have a URL that will let you download your post history as a ZIP file. Unzip the file, and you can have your precious Miiverse postings preserved for all time. You must put in your request before the service ends or you won’t get access to your post history. Additionally, some posts may not be included in your history “due to their status,” so just in case, back them up on your computer. Also, if you violate the terms of the Nintendo Account User Agreement and the Miiverse Code of Conduct, you could potentially lose eligibility to receive your post history. RIP Miiverse. We’ll miss you and your dank memes.